Nae Pasaran, the compelling feature documentary telling the story of how Scottish factory workers helped make a stand against General Pinochet’s military coup in Chile, has won BAFTA Scotland 2018’s Best Feature Film Award. 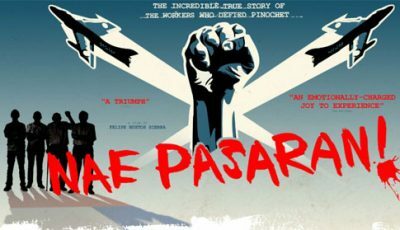 Nae Pasaran has taken home the award for Best Feature Film at BAFTA Scotland having been in competition alongside Karen Gillan’s directorial debut The Party’s Just Beginning and horror-musical Anna and the Apocalypse. Sierra added his delight that six years of research and work was now being seen by a wide audience. The film’s depiction of “solidarity, compassion and persistence” remain relevant, he says, as the reaction and word-of-mouth following screenings has shown. Nae Pasaran tells the incredible story of how Scottish factory workers defied Chile General Pinochet by taking a stand against his use of force during the military coup of 1973. The BAFTA Scotland-award winning film, directed with painstaking detail by Sierra, features the now-pension-age workers recalling their efforts to disrupt Pinochet’s Air Force.